Orijen/Acana is one of favorite brands. They have very strict quality control, and they only use fresh ingredients (never frozen). 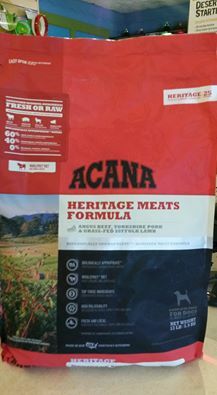 They are introducing a new line of foods called Heritage. It is a 60/40 ratio of meats and fruit/veggies compared to 70/30 in the Regional blends and 80/20 for Orijen. Additionally, all Acana foods are now produced here in the US in their brand new facility in Kentucky. All of their meats and produce are sourced locally so you know you’re getting the best, freshest ingredients. You’ll notice a name change on a few of their Regional Acana formulas, too. They are now purchasing very specific qualities of neat and the new name reflects that. Say hello to Ciao! Introducing our new AviTech supplements for birds!